Arranging a board meeting includes many moving parts. Most importantly, a written plan of topics to be discussed must be created. Board meetings typically cover a range of topics such as board member updates, reports and operational matters. Documenting the discussions is a key factor in the company’s progress and is the basis for evaluating important decisions. The use of a board meeting minutes software like MeetingBooster can help streamline these processes. 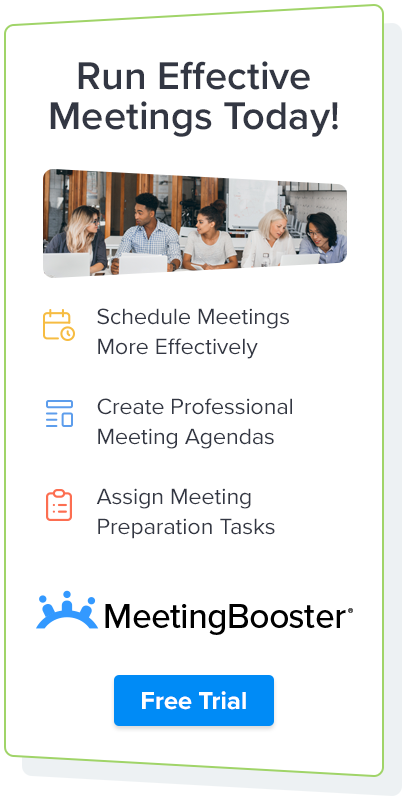 If you want to streamline board meeting minutes, using a meeting minutes software like MeetingBooster can make it easy, adding accountability and consistency while increasing overall effectiveness. The meeting purpose should be the first step in the meeting management process. Before you decide to have a meeting, ask yourself what’s the objective? If you can’t define a clear purpose or objective, then you shouldn’t have the meeting. Defining the purpose will assist you in creating the meeting agenda. The purpose should be listed at the top of the Agenda so that the attendees are clear on why they are there, what needs to be done, and how to know if the meeting is successful. Here is a list of the most common topics of board meeting, however there are several additional elements that you want to document as well. Regardless of the topics listed in the board meeting agenda, the minutes should include the company name, purpose of the meeting, the day time and location of the meeting as well as the board members present and absent. Be sure to attach any documents that were discussed during the meeting. Using a board meeting minutes software like MeetingBooster makes it easy to browse for documents and attach them directly to the minutes. The attachments are automatically archived with the minutes online. Though content management systems like SharePoint are popular options for storing data, meeting minutes software like MeetingBooster are built specifically for running meetings, consolidating the information and making it accessible to those with the rights to view the minutes. Create board meeting minutes now! When the meeting is adjourned, it is the note takers responsibility to review and finalize the minutes. It is important that the note taker match the minutes up to the agenda topics, ensuring that each topic has been addressed. Standard programs like MS Word are cumbersome when formatting company letterhead, and the redundancy of the note taker having to re-type the captured information into a more formalized meeting minutes document is a waste of valuable time. Meeting minutes software like MeetingBooster automates this process. Board meeting minutes are created using professional layouts, including all important information and organized in an easy to review format. Users can distribute the minutes to attendees and teams with a few clicks and the documents are archived for future access and review. Sign up for a MeetingBooster webinar.